My Tipping in balance post triggered some controversy as to do we tip the skis on edge from the ankles or the knees (i.e. knee angulation). This is indeed a widely misunderstood subject and debates rage on some ski forums and everywhere... there are no debates on this though in the higher circles of coaching and racing - let's see why. 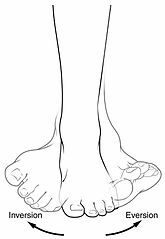 As Warren Witherell noted back in the 1960s, the biggest density of nerve endings is in our soles, the bottom of the feet. We've been using these since forever, to feel balance. These feelings are transmitted to the brain and the brain takes instant action to react and restore balance. Whether carving or not, we simply feel balance and react subconsciously. If we need a small adjustment, it is usually resolved at the foot level while bigger adjustments call upon the upper body. Just stand upright and slightly get yourself out of balance and pay attention to the lower foot muscle activations. It makes sense then to focus attention on the lower feet! Balance in the fore-aft plane is most efficiently achieved by pulling the skis back - that is how we get forward relative to the boots/skis, from the hamstrings and the ankles. Since the stiff boot restricts fore/aft angles, this is a limited range of movement, but sufficient to establish good forward pressure. Even if you try to push your hips forward, while you may feel that your body just got forward, since the skis are gliding at little friction (especially when unweighted during transition), most likely the skis were just pulled back instead... the stronger this movement is, the more likely it is that the skis were pulled back, as the body has a much bigger inertia and the skis glide freely on snow, for the most part. Tip with the feet and ankles. This is perhaps the most misunderstood aspect of all. If you ask beginners, they'll inform you that we ski with our upper body. They just throw the big mass into the turn or rotate it, trying to drag the skis with them. An advanced skier may tell you that the hips are what you use to turn the skis while even some experts swear that they turn with the knees. It is not a large movement and the boot restricts it somewhat - this is why even some professionals believe the ankle can't do much. It is however enough to put sufficient pressure on the side of the boot and tip the entire thing, by applying torque on the side of the sole and the sidewall of the boot. The ankle muscles are fantastic - just jump up and down on your toes and you’ll feel it. In fact, when inverting the foot, you don't even need that much effort, because you leverage the tall stiff boot cuff and the ski is not weighted (when you're doing it right). The kinetic chain is the connection of all the segments in the body. The kinetic chain is said to be "open" if the extremity is not fixed and "closed" otherwise (when pushing against the ground during a squat, the legs are in closed chain mode). If the skis are weighted (closed chain), it is indeed hard to tip them on edge - many conjure all kinds of big muscles and body parts here, because of a simple inability to release properly. When the skis are light or unweighted between turns (open chain mode) - tipping them from the feet is as easy as pie and by the time there is significant weight/pressure, the kinetic chain++ would have been activated properly, from the bottom-up, with upper body parts stacked on top of lower body parts. Some think "knee angulation", especially on the long straight skis, but the simple fact is that the ankle has a lot more range of movement in this direction than the knee - the knee is a hinge and cannot flex sideways - in fact it is not recommended since it puts it in an unstable position with risk. Sometimes the femur rotation in the hip sockets is brought up as an edging mechanism. This is a more powerful movement. Initially, at small edge angles, a rotation of the femurs would pivot the skis, as the legs are long. It is important, at small angles, that the rotation of the femurs is really a result of tipping from the ankles, not a specific and/or strong movement, which would take the skis of the edge and just skid the tails around. As the skiing gets more and more dynamic, in both timing, range of motion and edge angles, these bigger joints and muscles will complement the lower joints and muscles, for speed and power. About the knees - we do see them move, so it is easy to revert and think "push the knee into the hill"... while skiing with the knees (by way of flexing and femur rotation) is possible, it is definitely not encouraged for racing and efficient skiing. I know that some coaches say “knees into the hill” or give specific knee-oriented directions, but that’s just cues. There is an entire theory on what we call “the kinetic chain”, on how the body’s joints and muscles work together and starting with the ankles triggers the best movement patterns. Big muscles are strong and not that precise, while small muscles are not that strong but tend to be very precise. If you're looking for grip in the middle of a set of carving turns, the small muscles will make for more precise movement. Putting the skis on edge from large body parts and under-utilizing the small muscles, will normally result in more imprecision and adjustments. At the same time, big body parts take more effort and time to move and the big muscles take more time to activate, so make sure you don't confuse the early activation of big muscles with what they'll actually end up doing. It is really easy to verify the role that the feet and ankles play in tipping the skis on edge. You should put the boots on and try it! Just put the boots on and sit down on a chair with the knees bent at a straight angle. Sit on your glutes, to allow the entire leg to move side to side. Relax your legs and make sure you can push your knees around left and right with the hands and they move unrestricted by active muscles in the upper leg. Then evert/invert the feet strongly while not opposing the movement - notice how it will tip your knees from side to side strongly with no thigh or other muscles activated. If you further, allow those upper leg muscles to aid the movement, then it's so much stronger. There is a very fine line between allowing them to "assist" the movement versus them taking control and tipping the boot from the top of the leg - these are strong muscles afterall and why we always direct focus and attention to the lower leg! This last piece is actually some of the best ski advice you'll ever get in one sentence! Now you know and, if you still insist on starting with the hips or knees, that's on you! I have 4 Atomic and Head race boots, of between 110 and 150 flex and they all allow the basic ankle and foot movements for eversion/inversion. It should not be too much because then you lose leverage and pressure. A boot that's too tight will not allow any foot deformation or ankle movement, significantly impairing the skier. A boot that's too loose on the other end will not transmit those movements efficiently to the ski/leg. See more about Ski boot setup. If your boots do not allow some ankle movement, you will have trouble torque-ing the sidewalls and tipping, indeed, and perhaps revert to just pointing the knees. You should have them adjusted at a good boot fitter - may need them modified or different/better footbeds. I have an older set of footbeds made for a bigger boot which I can't use anymore, for this reason: they restrict my ankle too much! Viewed 11623 times ( | Print ) this page.